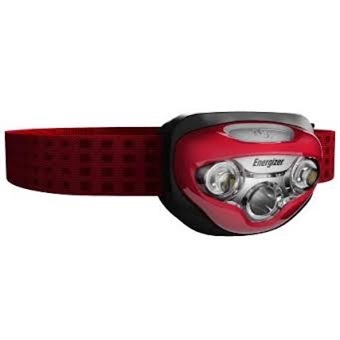 ENERGIZER VISION HD HEAD LAMP HDB32 3XAAA BTY [IPX4] is rated 4.0 out of 5 by 1. The Energizer® Vision HD headlight is another innovative headlight solution from the Energizer® premium headlight line. With the latest LED technology, users get a bright, lightweight hands-free solution with ample run time capability. Patented optics offer exceptional direct and peripheral vision, making the Energizer® Vision HD a perfect light for home, work and outdoor activities. With advanced switching technology, users can control the intensity of light from 100% to 10%., and enjoy Next Push Off technology to avoid unnecessary switch cycles. With an adjustable head strap, water-resistant design and pivoting head to direct light exactly as needed, this headlight is another way Energizer continues to deliver innovative lighting solutions. Rated 4 out of 5 by ImeldaMH from Nice purchase! - Energizer headlights for trekking It was so bright that it lights up the path for the 3 of us - the guide, me and friend to hike up Mount Ijen at 3am. The glow from his torchlight doesn't match my headlight !